Kala Stein is an artist, designer and educator known for her porcelain installations and modern tableware. She was noted for her innovations with non-traditional mold making and casting techniques and was named a Top Ten Emerging Artist in Ceramics Monthly magazine (May 2011). Kala is the Director of Ceramics at Sonoma Ceramics, Sonoma Community Center in California. She is currently making a new body of work in preparation for a solo exhibition beginning April 1, 2016 at Gallery 212, Sonoma Community Center. 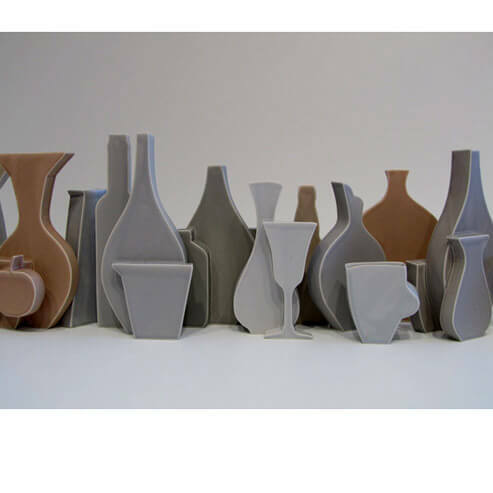 Kala is also a participating artist in Ceramics in Focus an exhibition at the Davis Art Center in conjunction with the California Conference for the Advancement of Ceramic Art, April 29-May 27, 2016. You can find Kala’s work this month in Accessibility by Design and 100 Cups at the 50th NCECA in Kansas City, Missouri. Among being busy creating work and running a new artist in residence program in Sonoma, she is also one of the newest board members serving the Association of Clay and Glass Artists of California (ACGA). Look for Kala in Kansas City this year, she is moderating the panel, “Making It: Artist as Entrepreneur” with Kristen Kieffer, Meredith Host, and Sunshine Cobb. Please browse Kala Stein’s new works at www.kalastein.com or on instagram: @kalasteindesign. To find out more about the fully funded, 6 month artist in residence program at Sonoma Ceramics, see instagram: @sonomaceramics. An intimacy with ceramic material and processes informs Kala’s approach to making. Her desire for classic and sophisticated beauty, optimum efficiency and sustainability is achieved through her deep understanding of material qualities and ceramic processes. With clay and plaster, Kala is able to make temporal actions permanent; gestures of the hand and tool are captured in the soft clay and plaster molds. Kala does not strive for a perfect, machined object, but instead incorporates variables into her systems of making. These variables honor the value of the craftsman and promise for a continuum of the handmade object. The work is produced in limited editions. Please contact Kala Stein directly with inquires regarding commissions, sales, press, or collaborations.